Universal apps that can run on anything from desktops to your cellphone are one of Windows 10’s main selling points. Of course, Microsoft chose its Office suite to show off the new app type during its press conference two weeks ago. You can now try out Office for Windows 10 yourself, according to a post on the Office Blog. Users signed up for the Windows 10 Technical Preview can now download the apps – including Word, Powerpoint, and Excel – from the Windows Store Beta. A universal version of OneNote already comes with Windows 10, while Outlook and Calendar are expected at a later date. Office for Windows 10 apps are optimized for touch-friendliness and compatibility with various screen sizes. 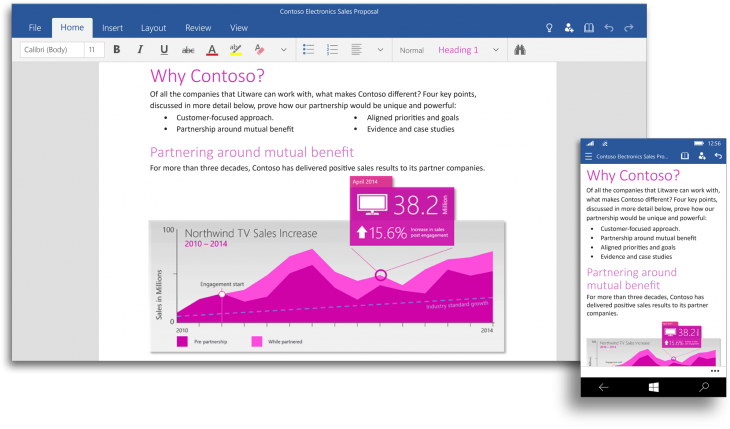 A separate Office 2016 suite aimed at desktop users will be released later this year. They wouldn’t be universal without a mobile form, however, so Microsoft says it will be introducing a user preview for the same apps on phones and small tablets in the coming weeks. The mobile versions will be further touch optimized for the smaller displays. If you haven’t yet signed up for the Windows 10 Technical Preview, you can do so here.